Telling people your every move isn’t what Twitter is intended for and people who push those updates make other people weary of Twitter. When someone bashed Twitter I always respond(ed) with, “YOU ARE USING TWITTER WRONG!” Yes, twitter is great for blasting mini press releases of your day, but it also has some great (practical) uses as well. 1.Brevity – Each message is only 140 characters at it’s maximum, so strategy is employed when crafting your message. According to ZDnet, Facebook allows 63,206! That is a huge difference. 2. Twitter can be one way communication – I can follow someone, and they don’t have to follow me back. Unlike Twitter, Facebook requires you to friend each other, and you mutually receive updates. Twitter has the ability to be one way. 3. Twitter is better at my fingers – Scrolling through Twitter on my mobile is a far better experience. Rightly so, with Facebook Timeline, it has concentrated much more on pictures. PIctures take up a lot of screen real estate and it takes far longer to get updated. When I want to view friends pictures, Facebook is where I go! 4. Meet new people – It is easier to connect with people you don’t know on Twitter then Facebook. Unless their account is priviate, which isn’t many anymore, you can follow whomever you want and receive their updates. Since I have started blogging about social media, I have connected with people across the country through Twitter, that isn’t as likely to happen on Facebook. 5. Connect with conference goers – If you have attended a conference recently, you saw people using a dedicated hash tag to talk all things conference. If you aren’t at the conference, you can get your hands on that hash tag and stay in tune with all that is happening in your absence. Texting during a presentation is status quo. Updates your followers on what is happening gives them a front row seat even if they aren’t there. 6. Follow your idols – It is far easier to follow celebrities and brand on Twitter! Celebrities gravitate towards Twitter and the social network welcomes them! Lady Gaga just hit 25 million! 7. Be in the know – There is so much to be said about Trending Topics. Trending Topics are a great way to stay informed about what is happening in the world. A topic becomes trending when enough people are talking about it in a certain time frame. It is my life goal to start a trending topic on Twitter. 8. Twitter is the cool party – I have actively chosen who I follow on Twitter and most of the updates I see come from tech writers, bloggers, good friends, a few celebrities, athletes and news outlets. I am not bragging when I say this, but I have over 1000 friends on Facebook, and now it is an over crowded party. Twitter is that small get together where you leave wanting more. Don’t get me wrong, my job as a social media specialist is heavily focused on Facebook, but I also tweet for Ask Big Questions and use both outlets for personal use as well. I prefer the personal experiance I have on Twitter over Facebook. Twitter is only growing and it is worth checking out if you don’t use it, or you have been using it wrong. I have had a few Twitter successes when meeting people, working on something for my job or connecting with the right person. I’ll post about those in a future post. How do you feel? 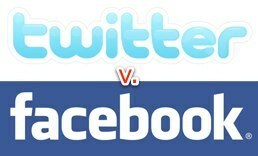 Are you loyal to one social network over the other? 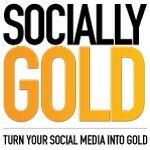 Comment here or on on my Facebook Page SociallyGold and be apart of the conversation.